Operation Torch was designed to trap the German and Italian troops between British forces moving from the east and American forces invading from the west in French North Africa. Driven back from Egypt by the British Eighth Army, the Germans decided to hold Tunisia, which would give them control of shipping in the Mediterranean. In February 1943, the Africa Corps attacked in an attempt to force an Anglo-American withdrawal into Algeria. Devastating blows hammered troops in the mountain ranges and passes that ringed the Tunisian coastal plains. At Kasserine Pass, the 39th Infantry Regiment‘s 3rd Battalion was among the American troops overrun by the German Panzers. Its Anti-Tank Company had few casualties, but lost all of its guns. On February 17th, the 9th Infantry Division’s Artillery was ordered to the defense of Thala. 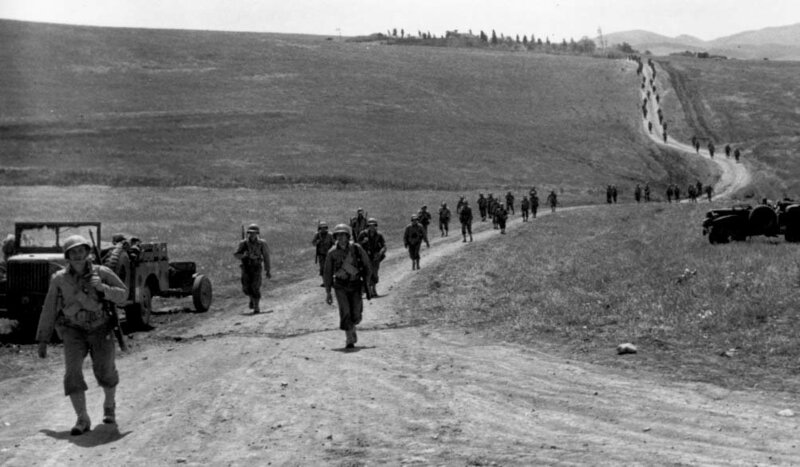 By late afternoon, with 34th Field Artillery Battalion leading the way, the 60th Field Artillery, 60th Cannon Company, Headquarters Battery, the 84th Field Artillery and the 47th Cannon Battalion were on a forced march from Tiemcen in Algeria, to Thala in Tunisia. In bitter weather over tortuous, almost impassable mountain roads, 2170 men and officers and 411 vehicles covered 735 miles in 100 hours. During the closing hours of the 21st of February, the Artillery rolled into position. At 7 am German armor, three Battalions of Infantry aided by Artillery and dive bombers, attacked along the Thala defile. 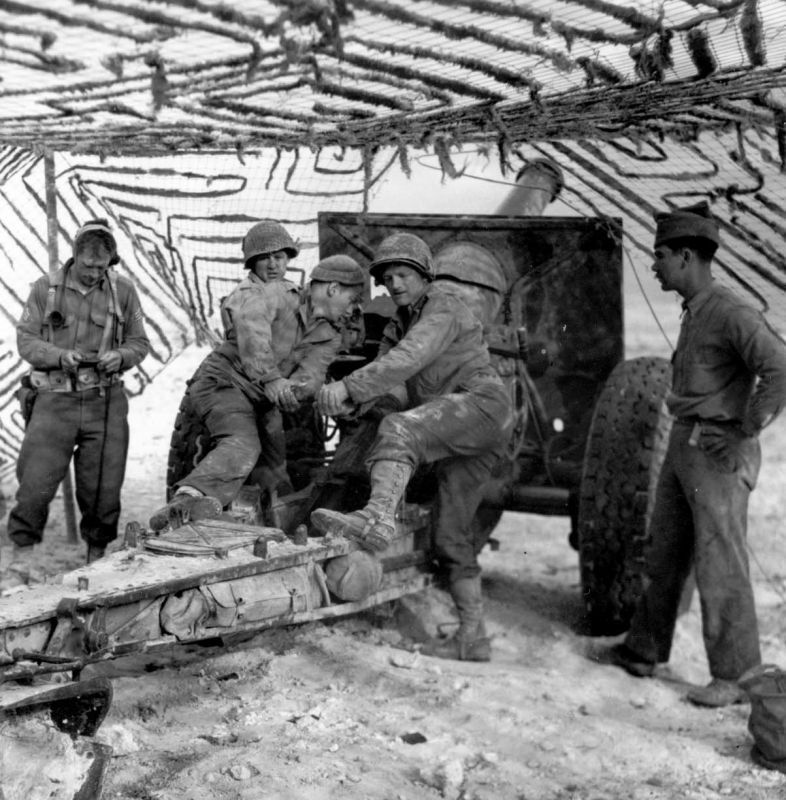 Battery C of the 84th Field Artillery was sent forward to an anti-tank position where the 105mm howitzers were lowered and fired point blank at oncoming enemy tanks. The battle raged on for three hours. 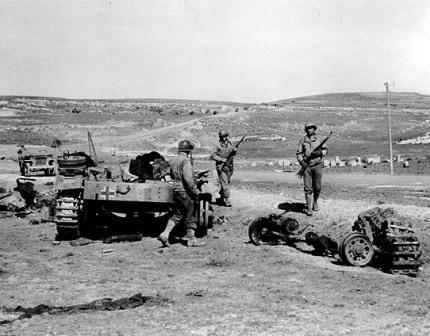 The Germans then withdrew, ending their attempt to drive the Allies back into Algeria. 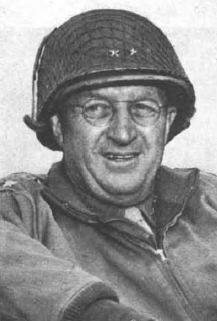 Major General George S. Patton assumed command of II corps in early March, with the 34th Infantry Division operating with the British in the North, while the 9th Infantry Division was operating to the south with the 1st Infantry and 1st Armored Divisions. II Corps had the immediate task to secure Maknassy Pass and to break out into the Tunisian coastal plain through the El Guettar Pass. Then the German General Rommel would have to retreat or be cut off from the rear. With the 60th Combat Team now motorized and attached to the 1st Armored Division, it advanced on the though 21st German Panzer Division defending Maknassy. Its objective was a hill mass dominating the rail line passing through Maknassy, named Djebel Goussa, and was taken in the night of March 20th, 1943. Two days later the town was captured as well. Though the Americans were able to clear enemy outposts in the mountain ranges around the town, they were unable to penetrate the pass itself. A series of local attacks were inconclusive. Finally, when the British Eighth Army made contact with the 1st Armored Division, the German troops withdrew. At El Guettar, the 9th Infantry Division fought for the first time under the command of Major-General Manton S. Eddy. The enemy was well entrenched and possessed air superiority. The mass of steep, rugged hills and eroded gorges provided a natural fortress. To make things worse, General Eddy got involved in a car accident that resulted in a crushed hand and both legs injured. It was not the easiest thing to do, leading a Division while hobbling around on crutches. 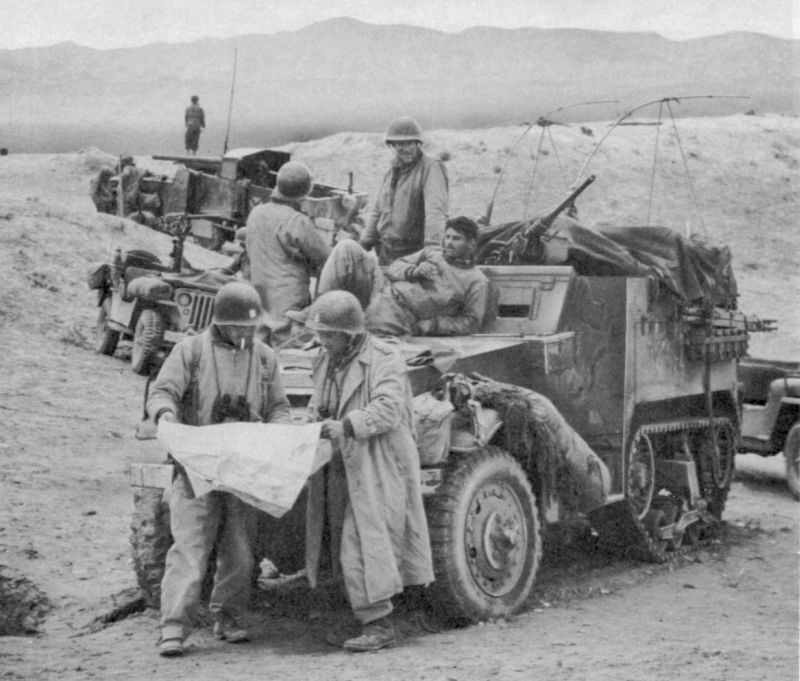 The 9th and 1st Divisions were to seize opposite sides of the El Guettar Pass, enabling the 1st Armored Division to roll through without being fired on from its flanks. At “H-Hour”, 6 A.M. on March 28th 1943, the 47th Infantry Regiment was in position to take that day’s objective, being Hill 369. Although the objective area was reached quickly, darkness and poor maps had led the 47th Infantry Regiment astray to El Hamra Ridge. There was no need to worry the commanders thought: 2nd Battalion of the same Regiment had been sent on a flanking movement and would get the job done. However, 2nd Battalion was caught in a murderous crossfire decimating Company E. The Battalion’s Commanding Officer and Communications Officer were captured, as was the commander of Company E and 175 of his men. The Commanding Officer of Company F and 6 men along with one officer of Company H and an aid to General Eisenhower were captured too. 1st Battalion of the 39th Infantry Regiment was committed to help out but became lost in the maze of hills. With Hill 369 still in German hands, the attack bogged down. Off on the edge of the Ninth’s zone, another Hill dominated the area, Hill 772. 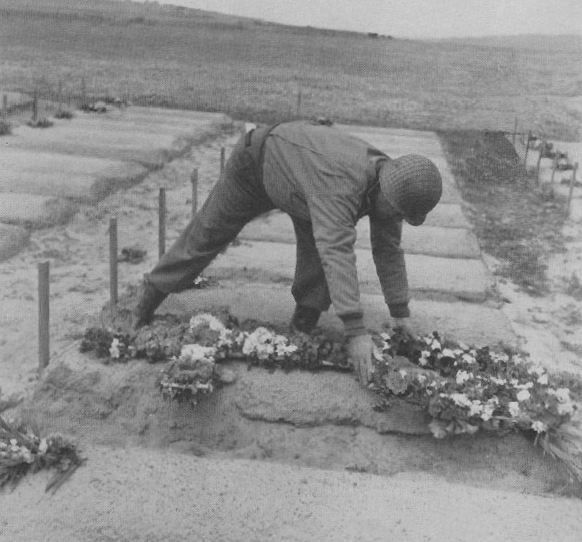 It had been occupied by American troops but these had been moved off just before the El Guettar offensive began. The German troops then re-occupied the hill, but none of the other commanders thought to tell this important information to any members of the Ninth Division! So, General Eddy soon realized that Hill 369 could only be taken by gaining Hill 772 again. For five days the battle raged in an attempt to break through the El Guettar Pass. Each attack was a coordinated push of “Benson’s Force”, an Armored Task Force and the 3rd Battalion of the 39th Infantry Regiment. When it seemed that the Germans were going to mount a major mechanized counterattack on April 4th, the 15th Engineers were sent to occupy defensive positions as Infantry. However, two days later it became apparent that the enemy was going to withdraw to head north for a last stand in Tunisia. The 9th Infantry Division attacked to seize Hills 772 and 369. “Benson’s Force” moved through the Pass and met the Eighth Army coming up from the South. Finally, the El Guettar Pass was taken! After this battle, the men of the Ninth Division were given a two day rest period. A nice surprise came from General Patton who wanted to show his appreciation: Steak dinner for the Ninth men! In the northern part of the II Corps zone, the 9th Infantry Division and the Corps Franc d’Afrique were going to conduct an offensive which, however “secondary” in the scheme of operations, would achieve very useful results. This action would take place so far from the Sidi Nsir-Tine Valley area as to constitute in effect a separate battle, but one which had its place in the Corps’ plans and the Corps’ success. On 23 April, the 9th Infantry Division and the Corps Franc d’Afrique held a 28-mile front extending from the sea to a point 5 miles west of Sidi Nsir. The II Corps plan provided that the 9th Division would seize the Ainchouna-Jefna area, where the Germans held hill fortresses dominating the approach to Mateur through the Sedjenane Valley. In executing this mission, the 9th Division had to meet difficulties imposed both by terrain and by the very broad front involved. The 91st Reconnaissance Squadron and the 34th Reconnaissance Troop were assigned to patrol vigorously in the 9-mile gap between the 9th and 34th Divisions. No attempt was made to send large units through this area, which gave no access to better routes. Furthermore, it was cut up by small streams, had few trails, and led into rough terrain dominated by flanking ridges. The main German positions around Jefna were to be outflanked through the bills to the north. The Jefna position, one of the strongest German defenses in all northern Tunisia, included two heavily fortified hills lying a mile and a half west of Jefna Station and commanding the Mateur road: Djebel el Azzag (Green Hill) on the north of the road and Djebel el Ajred (Bald Hill) on the south. The 39th Regimental Combat Team was to strike at the Djebel Ainchouna strong points north of Jefna. The 47th Regimental Combat Team was assigned to make a holding attack against the Jefna position. The 60th Regimental Combat Team and the Corps Franc d’Afrique were to drive eastward against the more lightly held positions on both sides of the Sedjenane River. For this, the 9th Infantry Division was moved two hundred miles north where II Corps mounted a drive on Bizerte. The 9th Division put its main effort into the successful flanking attack on Jefna. Farther to the north, the 60th Combat Team and the Corps Franc carried out an operation which extended the flanking movement all the way to the coast and insured that no part of the Axis line would escape pressure. This operation took place in the scrub-covered mountains north of the Sedjenane Valley. A road to Bizerte winds through the region, but communications were even more difficult than in the zone farther to the south. A member of the 60th Combat Team has described the terrain as “a continuous challenge to the ingenuity, perseverance, and fortitude of our troops”. Supplies, weapons, and ammunition had to be carried by burros, which were often hard to obtain. Numerous patches of dense scrub, almost impenetrable, hindered advancing troops and required the use of a trail-breaker. The few roads in the area were mined, but the barely distinguishable trails were practically free of mines and booby traps. Because of liaison difficulties and the speed of the advance, attacking units frequently lost contact with their artillery support. German positions were sometimes defended by a single barbed wire strung so as to break a rush. Frontal attacks were highly impractical because the enemy had the advantage in well-placed machine guns and mortars. Consequently, as in other areas captured by the II Corps, tactics in this zone were built around flanking maneuvers by small units. Because of the excellent opportunity offered for concealment, retreating enemy troops frequently fell back into the scrub, waiting for nightfall and a chance to infiltrate by patrols. The attack in the early hours of 23rd of April, 1943 opened with a tremendous fire barrage. For the 9th Division, the density of artillery was an estimated one piece per 630 yards of front. This measurement was not only found in the number of guns, but also in the volume of rounds fired! 40,576 Field Artillery rounds were fired in the 9th Infantry Division sector. 10 per cent of these were smoke shells. The 60th Infantry Regiment’s 2nd Battalion started their attack under command of Major “Black Mike” Kauffman, from Djebel Mergueb, on the north side of the Sedjenane River and occupied Hills 165 and 253 (named Djebel Oum el Adame). They then occupied the most dominating hill of the region Hill 294 (Djebel Dardyss) situated about 4 miles north of Ainchouna. The undergrowth was so bad at certain places that men sometimes had to crawl on hands and knees up the slope to reach the summit. The next morning around 1000 hours, two Battalions of German Infantry supported by artillery fire hit the men of the 60th Infantry Regiment from all four sides. After 4 fours, the enemy retired, leaving 116 dead, 48 wounded and a number of prisoners behind. The 2nd Battalion of the Go Devils lost 21 dead and had 111 men wounded, but still held on to the hill. 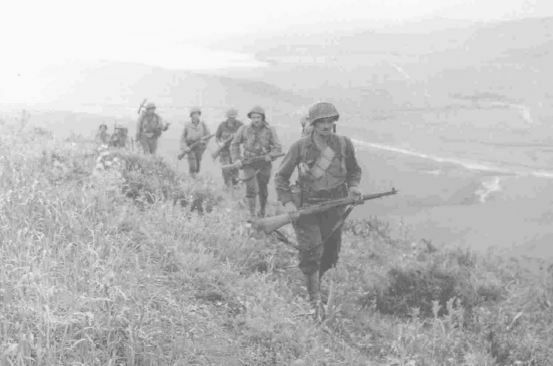 Reinforced by three Battalions of the Corps Franc d’Afrique that pushed toward Bizerte on the northern flank, the 60th Infantry Regiment assaulted hill positions on both sides of the Sedjenane Valley. On the north, the 2d Battalion moved northeast from the Djebel Dardyss and Djebel Oum el Adame Hills toward Hill 299 (Kraim Lerhmed), which was occupied on 28 April. The next day the battalion advanced northeast about 2 miles to Djebel Hazemat (Hill 273) and remained there for 3 days patrolling positions to the front. South of the valley, the 1st Battalion moved northeast from Hill 2o8 toward Kef Sahan (Hills 337 and 299). One platoon occupied Hill 337 on 28 April, and the rest of the battalion came up the next day. On 30 April, the 1st Battalion continued southeast to occupy Djebel Guermach (Hill 490). By 29 April the 3d Battalion had advanced northeast about 2 miles to Kef el Zrabin (Hill 230). In this area the enemy held out strongly at Kef en Nsour (Points 412 and 523), lying 2 miles northeast of Djebel Guermach. Two positions in front of Kef en Nsour were taken on 30 April and 1 May. With the assistance of one company of the 1st Battalion, the 3d Battalion captured Kef en Nsour the next day. Meanwhile, the 39th Infantry Regiment was situated on the spur of high ground south of Oued Sedjenane to relieve the British 1st Parachute Brigade. The three battalions then occupied a triangular area made by Djebel Guerba, Djebel Rachtouil, and Djebel el Oumela. Four miles east of the center of this area lay Djebel Ainchouna, a series of peaks and ridges about 4 miles long. Minefields guarded the approaches to this high ground, and the enemy positions afforded excellent observation and good fields of fire. Enemy artillery, wherever weak, could be supplemented by tanks employed as mobile artillery. To make an attack, our troops were compelled to struggle through scrub and high underbrush and up rough, steep slopes.They were opposite Djebel Ainchouna Hills 432 and 498. The 39th Infantry Regiment ran into trouble though while crossing an enemy infested Djebel Ainchouna, four miles of dense overgrowth, with the two hill peaks of 432 and 498 rising over 1500 feet. As the Regimental Commander Colonel J. Trimble Brown and his staff were moving their Command Post, a 150 man strong German Combat Patrol captured them. Captain Felix P. Settlemire and a small group had to shoot their way out. Although painfully wounded, Captain Settlemire led some Company G Infantry men in a counterattack, capturing and killing more than 45 Germans. Most of the Captured Americans were liberated again, but papers and plans seized by the enemy were not recovered. Between the 20th of April and the morning of the attack, the 39th Combat Team moved forward to the base of Hill 432, without encountering opposition. The attack against Hill 438, the dominating height on Djebel Ainchouna, jumped off at about 0600 on April 23rd, with the 1st and 3d Battalions on the line and the 2d Battalion in reserve. The enemy fought stubbornly with rifle, mortar, and machine-gun fire and grenades. On the 24th and 25th of April, the 39th Infantry Regiment pushed on to occupy Djebel Ainchouma. The fighting went in sudden spurts with attacks blocked by the hardened enemy resistance. Artillery and mortar fire hammered 2nd Battalion for days at a ridge line peak named Hill 382, but on 25th April, Hill 438 was finally captured by the 1st and 3d Battalions. During the remainder of the first phase of the campaign, the 39th Combat Team zigzagged from hill to hill, driving the enemy back toward the Mateur plain. On 26 April the 2d Battalion captured Hill 498, a mile southeast of Ainchouna, and Hill 513, a half mile northeast of 498. While the 3d Battalion took over Hill 498, the 2d Battalion pushed on to the east, and on 27 April occupied the south slopes of Hill 382. The 2d Battalion met strong opposition at Hill 382, which resisted for 4 days, but the other two battalions were able to move rapidly. At daybreak on 28 April the 1st Battalion drove the enemy from Hill 164, 2 miles north of Ainchouna, and then turned southeast to take Hills 336 and 377, located about 2 miles north of 382. On 30 April the combat team concentrated its attacks to wipe out the enemy positions in the 382 area. The 1st Battalion attacked Hill V6, less than a mile northwest of Hill 299, captured it before 1000, and then aided the 3d Battalion in a successful drive over Hill 299. At daybreak the 2d Battalion, supported by the Cannon Company and Divisional Artillery, launched an attack against Hill 382 that swept the entire strong point. The 39th Combat Team was now able to exert the strongest pressure on the Jefna position. After the capture of Hills 299 and 382, our infantry held the high ground and had the advantage of dominant observation. German supply routes, dumps, and installations supporting the Jefna defenses were brought under heavy artillery fire. In one day the 26th Field Artillery Battalion fired more than 4,000 rounds with devastating effect. On 1 May the Germans began their withdrawal to the northeast, and when patrols pushed forward the next day they found quantities of abandoned enemy equipment. The 39th Combat Team was then only 3 miles west of the eastern edge of the hill mass and had completely outflanked the Green Hill-Bald Hill positions. The 47th Infantry Regiment, relieving the British 138th Brigade in the south on the 13th of April, took up positions 5 miles from Jefna Station on both sides of the Sedjenane-Mateur road and railroad and prepared to exert pressure toward Jefna. Bald and Green Hills were subjected to air bombardment and heavy artillery fire. 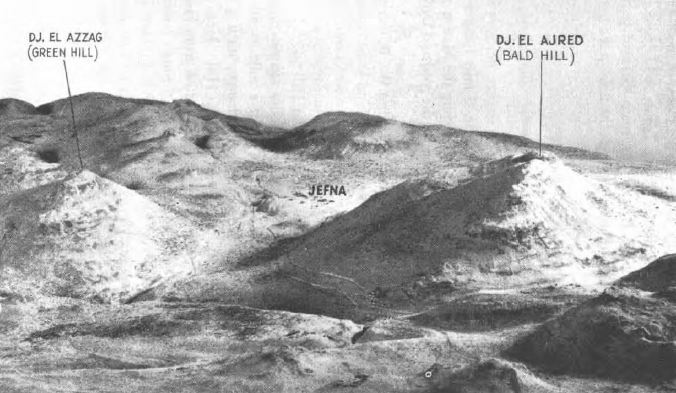 On 23 April, from positions near Hill 398 (Djebel ez Zeboudj), the 3d Battalion moved toward Jefna against relatively light opposition and occupied two hills about a mile to the east. These positions were held with only slight changes until 3 May, while strong patrols operated as far east as Green Hill. Meanwhile the 1st Battalion on the south of the road jumped off from Hill 610 (Djebel el Mehachem) and advanced in 4 days through a series of hills to within a mile of Bald Hill. Hill 605 (Kef Maksour) was occupied on the first day (23 April). After strong artillery preparation on 25 April, Hills 598 and 502 were captured. Further advances were made on 26 April, and Hill 501 was occupied during the day, after artillery fire had cleared the hill of enemy troops. From 29 April to 2 May, while the 39th Regimental Combat Team was outflanking Jefna on the north, the 47th Infantry maintained pressure on the main German positions at Bald and Green Hills. Patrolling was very active, and artillery fire constantly harassed the enemy. Nevertheless, the Germans held tenaciously to their well-prepared fox holes and emplacements on the forward slopes of Green and Bald Hills. Prisoners captured on 2 May stated that they had been ordered to withdraw toward Bizerte. Patrols confirmed this enemy movement; on 3 May the 47th occupied Bald and Green Hills, and reconnaissance of the Jefna-Mateur road showed it to be free of enemy troops. The withdrawal of the enemy from the very strong Jefna position can be explained only in terms of the successful flanking maneuver in progress to the north. By performing all of these actions, the 9th Infantry Division attacked the enemy defenses astride the only decent road in the north leading into Bizerte. By May 4th 1943, the 9th Infantry Division had advanced 12 miles in 13 days over almost impassable terrain. Large stores of equipment and material had been captured as well as 815 prisoners.The units had driven to the edge of the hill belt overlooking the Mateur plain and Garaet Achkel, and here again the Germans were fighting on the eastern rim of the best defensive ground. At every point where the II Corps attacked, the enemy had offered bitter and stubborn resistance, marked by frequent counterattacks to recover lost ground. Despite all their efforts, by the 1st of May the Germans were in a critical situation in the whole II Corps zone.By the 2nd of May, in the northern sector, the enemy faced the fact that his strongest positions were lost or outflanked. The 9th Division had helped to make inevitable the German retreat to the east. The II Corps advance had dislodged the enemy from his best defensive positions in two areas. In the south, the main effort had fully opened the corridor to Mateur down the Tine Valley. By its failure to retake Djebel el Anz and Hill 609, the enemy was left fighting on the edge of the high ground, with lower rolling country behind him to Mateur. In this country there was no such series of naturally strong positions as the II Corps had just conquered. Full use of Allied armor was now possible, and a successful American attack north from Djebel Badjar might easily become a breakthrough, cutting off German units still in the hills to the northwest. The maneuvers of the 9th Division had rendered the enemy’s Jefna strong points untenable. The flanking columns of the 9th Division had pushed so far northeast of Jefna that the Germans here also were hanging on to the edges of the last high ground protecting the Mateur plain.To avoid disaster, the enemy facing the II Corps undertook a general retreat on the night of 1-2 May and the next day. Enemy forces in the southern sector withdrew eastward, to positions located from Ferryville south toward Chouigui and Eddekhila. Here, on a north-south belt of hills, the German forces still hoped to protect Tebourba and the Tunis Plain. North of Garaet Achkel they pulled back to the hills bordering that lake and prepared a last-ditch stand on the main road to Bizerte. One last ring of rugged hills now remained between the Ninth Infantry Division and Bizerte. The German troops on Djebel Cheniti, the highest point on the 8 mile wide area of the Bizerte Isthmus, halted the advance of the Corps Franc. To break this bottleneck, General Manton S. Eddy devised a successful flanking maneuver. The 1st Battalion of the 60th Infantry Regiment then took Djebel Cheniti by direct assault with bayonets following artillery concentrations that pounded the slopes at 100 yard intervals.On May 6th 1943 it was a slippery, muddy and rainy day. German machine gun crews began taking off for Bizerte as the 9th Infantry Division advanced. The enemy also appeared to be evacuating the city. At mid-day on May 7th, 1943, Lieutenant Colonel Charles P. Eastburn’s 894th Tank Destroyer Battalion rolled into the city and were greeted by German snipers, time bombs, booby traps and mines. Lieutenant Orion C. Shockley of the 47th Cannon Company remained behind on the roof of the Hotel de la Marine. The next morning he directed fire from his guns and the artillery men knocked out four 88mm’s, two 20mm anti-aircraft guns and one mounted 20mm machine gun. 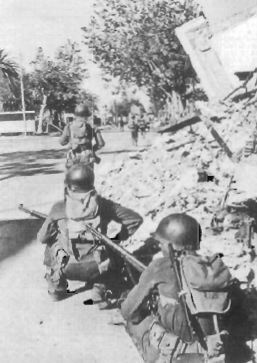 On the 8th of May, 1943, the first Allied infantry men to enter the port of Bizerte were members of 2nd Battalion, 47th Infantry Regiment. They stepped aside however, to allow the Corps Franc Battalion to mop up in the city. On May 9th the enemy surrendered in the II Corps zone and on May 13th the remainder of the enemy capitulated to the British on the Cap Bon Peninsula. The enemy was now out of Tunis, so out of Africa!